What if you could have all of the benefits of Medicare with the benefits that come with private insurance? With a Medicare Advantage plan, you can. Medicare Advantage plans, also called Part C, combines Original Medicare (Part A and Part B). These plans are offered by private insurance companies that contract with Medicare, providing patients with an additional way to receive Medicare benefits. All Medicare Advantage customers are still considered Medicare patients. As such, all Medicare Advantage plans must cover all the same benefits as Original Medicare, including Part A (hospital) and Part B (medical). The only exception is hospice care, which is covered under Original Medicare for all Medicare Advantage patients. Because they are private plans, Medicare Advantage plans can also include additional benefits and coverage that are not offered by Original Medicare, such as prescription drug coverage. As with any private insurance, what is and isn't included in a Medicare Advantage plan can vary based on the plan. With the benefits of Original Medicare combined with the options and flexibility of private insurance, Medicare Advantage plans offer the best of both worlds for qualifying customers. Patients have the option to find a plan that's a better fit for their own personal healthcare needs. But this flexibility means there's a lot to learn about shopping for the right Medicare Advantage plan. If you already know what you’re looking for, start shopping for quotes, comparing plans and contacting agents. With more than 180 insurance providers nationwide, HealthMarkets can help you compare your health and budget needs to policies available in your area. If you're unsure of what kind of Medicare Advantage plan you need or whether they are right for you, watch the video below and read on for more information. Medicare Advantage plans are steadily gaining in popularity. The number of Medicare Advantage customers has tripled since 2004, and over 30 percent of today's Medicare recipients are experiencing the highlights of a Medicare Advantage plan. But before shopping for plans, you should first determine if Medicare Advantage is for you by Evaluating some key differences between Medicare Advantage and Original Medicare. Original Medicare patients pay a premium for Part B coverage and only pay a Part A premium if they have fewer than 10 years of United States work history. Medicare Advantage plans require customers to pay the same premiums as Original Medicare. In addition, each plan may or may not have its own premium. Original Medicare patients pay a deductible as well as coinsurance, or a percentage of the service received (usually 20 percent for Part B). Medicare Advantage plans have deductibles, but may offer copays instead of coinsurance. The costs of deductibles, copays and/or coinsurance varies with each individual plan. It's important to research each plan carefully to determine what your out-of-pocket expenses will be. Original Medicare does not have an out-of-pocket limit, meaning there's no cap on what you could end up paying out of pocket for health care. All Medicare Advantage plans must come with an out-of-pocket limit that will allow patients 100 percent coverage for anything over the limit. The amount of these limits will vary from plan to plan. In most cases, Original Medicare allows patients to visit any doctor or hospital in the country that accepts Medicare. Medicare Advantage plans that follow a Health Maintenance Organization (HMO) model usually restrict customers to a network of selected physicians. As with many private insurance plans that operate within a network, you may be required to have a Primary Care Physician (PCP) and get referrals to see specialists. However, there are Preferred Provider Organization (PPO) Medicare Advantage plans that allow you to see a doctor outside of the network, but it may cost more (more on this later). Patients with Original Medicare are free to purchase Medigap to help supplement their Medicare coverage. Customers with Medicare Advantage plans may not buy any supplemental insurance through Medigap. Original Medicare customers must purchase a separate Prescription Drug Plan (PDP) from a private insurance company if they wish to obtain coverage for prescription drugs. This is known as Medicare Part D.
There are some Medicare Advantage plans that include coverage of prescription drugs. These are called Medicare Advantage Prescription Drug Plans (MA-PD). If you enroll in a Medicare Advantage plan that does not include prescription drug coverage, you cannot purchase a Prescription Drug Plan from another company (excluding some PFFS plans). Original Medicare covers services that are deemed medically necessary and does not include dental, vision or hearing care. Some Medicare Advantage plans include coverage for extra services such as dental, vision and hearing. Medicare Advantage plans are not allowed to charge more than Original Medicare for certain services like chemotherapy, dialysis and skilled nursing facility care. Yes. Visit any physician that accepts Medicare. The biggest difference between Original Medicare and Medicare Advantage is the diversity of plans offered by the latter. The structure of these plans mirror traditional health insurance plans. HMO. Health Maintenance Organizations have a specific network of select physicians and may require a referral from a Primary Care Physician before seeing a specialist. But HMOs provide additional benefits like coverage for deductibles and more. PPO. A Preferred Provider Organization allows customers to save money when they use a physician inside of the plan's network. Customers are still able to see doctor's outside of the network, but may have to pay a higher cost. PFFS. Private Fee-For-Service plans work similarly to that of Original Medicare, but the plan itself will determine how much it will pay the physician or facility and how much the patient will pay out of pocket. SNP. Special Needs Plans provide coverage for those in specific situations such as limited income or who have certain chronic medical conditions. HMOPOS. A HMO Point-of-Service plan operates like a HMO but allows for some services to be covered by an out-of-network physician. MSA. A Medical Savings Account plan combines a high-deductible plan with a bank account where money is deposited by Medicare to be used for health care services. After declining slightly in 2014 and 2015, the number of available Medicare Advantage plans increased for 2016. The total number of plans is approximately 2,000, with 259 of those being new to the market. In fact, 37 states experienced either an increase in the number of available plans or remained consistent with their 2015 offerings. In addition to the new plan offerings, some new insurance providers joined the Medicare Advantage market for 2016. Medicare beneficiaries had an average of 19 plans to choose from for 2016. Medicare Advantage plans are rated by the federal government on a scale of one to five stars based on measures such as quality of care, accessibility and customer satisfaction ratings. As with most private health insurance plans, there are certain dates placed on when customers can enroll in or change a Medicare Advantage plan. In order to make an initial enrollment in a Medicare Advantage plan, you must first be eligible for Original Medicare Part A and Part B. Second, you may not enroll in a Medicare Advantage plan if you have end-stage renal disease. Initial Enrollment Period (IEP). This is the seven-month period beginning three months before you turn 65 years old, your birthday month and the three months after turning 65. This is when you can enroll in a Medicare Advantage Plan for the first time. Under 65 with a disability. If you are not yet 65 years old but are disabled, you can sign up for a Medicare Advantage Plan 21 months after receiving Social Security or Railroad Retirement Board benefits (RRB). General Enrollment Period. January 1 to March 31 is the time to enroll if you didn't sign up when you first became eligible. If you enroll during this period, you will receive coverage starting July 1. However, you may have to pay a higher premium(s) for enrolling late in Part A and/or Part B. During this time each year, customers may leave a Medicare Advantage Plan and enroll in Original Medicare. While Medicare Advantage plans differ from Original Medicare in a number of ways, one thing remains a constant: It's important to conduct your due diligence and find the plan that best fits your healthcare needs and budget. Contact HealthMarkets today at (800) 360-1402. We have more than 3,000 licensed agents who are happy to assist you with all your Medicare Advantage needs. Sources: "How Medicare Advantage Plans work | Medicare.gov." 2012. | “Medicare Advantage Plans Cover All Medicare Services | Medicare.gov." 2015. | "Medicare Made Clear - AARP Health." 2011. 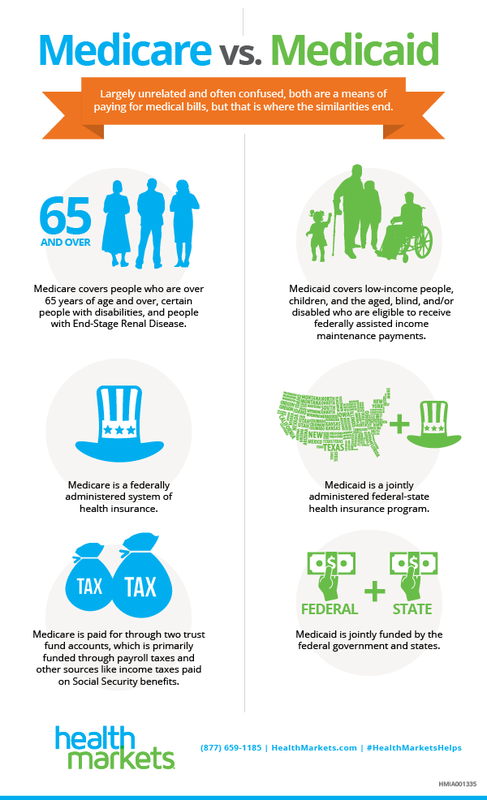 | “Medicare 2015 & 2016 Costs at a Glance.” Centers for Medicare and Medicaid Services.” 2015. | Young, Chris. “Medicare vs. Medicare Advantage: How to Choose.” U.S. News and World Report. 15 Oct. 2014. | "How Original Medicare works | Medicare.gov." 2012. | "Prescription Drug Coverage - Medicare.gov." 2012. | 13 Things to Know About Medicare Advantage” 2105. | "What's a Medicare Advantage Plan? - Medicare.gov." 2012. | "What's In and What's Out? Medicare Advantage Market Entries and Exits for 2016 « » The Henry J. Kaiser Family ..." 2015. | "What's a Medicare Advantage Plan? - Medicare.gov." 2012. | "Understanding Medicare Part C & Part D Enrollment Periods." 2012. | "Medicare & You - Medicare.gov." 2012.